before the storm. — PEACH-TREE, PEAR-TREE. Saturday evening. It was hot; the breeze, when it blew, was warm and dusty. I went for a walk: through the park, along the river, across the city, and out to the gorge. I got there just before sunset. Daisies and picnic-parties were scattered across the grass. The sky bloomed with birdsong. Listening, I tried to resist the impulse to name; to impose category and identity felt like violence, as though one uncareful movement might unravel this shifting, luminous mesh that softly enveloped the world. As the light faded, everything intensified. Over the bridge and over the woods, light sank and darkness rose. The earth was turning. Everything was moving. Everything was still. Down into the gorge, along the steep path cut into the cliff. The woodland here feels ancient, magical, alive; in the waning light, everything was glowing. Beneath the bridge, beneath the trees, in the deepness of what isn't ever quite silence. Lower and lower, descending with the sun. Every step a sacrament. How we inscribe ourselves upon and into the world. 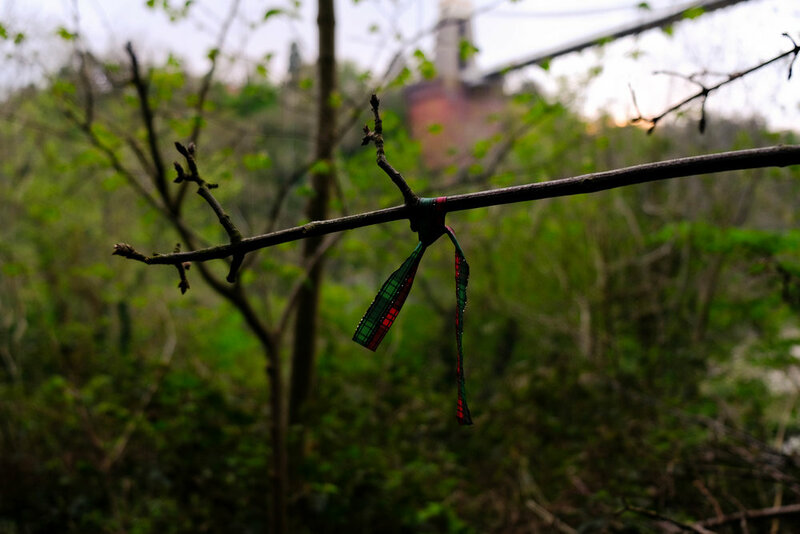 Somebody had been here before me, had left pretty ribbons in the trees. We cannot escape the compulsion to weigh upon the world. r e v e r e n c e . . .
At the bottom now, stormclouds in the south, and night flooding from the east. We look for light wherever we can find it. Walking home, I stopped at a crossing and looked back towards the west. The earth had turned; the sun's light scattered and refracted across the clouded horizon. The air was close and still. Quiet. Expectant. A moment later, the storm came.